Meet... the beach thingy chair back thingy! Looks like your days of toting an uncomfortable folding chair to the beach are numbered. Conventional chairs are always hard to open, squish you in unfortunate places and often fold up *while* you're sitting on it. 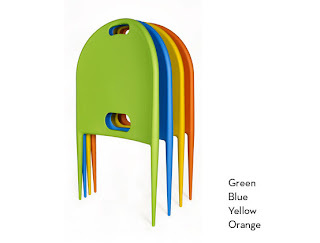 With the 'beach thingy' by Larry Laske, all your beach seat problems melt away with the Summer heat. Basically, these colourful inventions are just plain ol' seat backs. You push the seat's prongs into the sand and presto!! Instant seat back on the beach! Available in a happy array of colours, collect them all! To be frank, I haven't actually tried one of these babies, but I'm intrigued & think they're definitely worth a try or two! That is awesome!!! Now only if it were hot out and there was a beach nearby.